Republicans have become the party of “No we can’t” and Democrats have become the party of “Yes we can, but…”. Gone are the days of big ideas and big plans for the future. We no longer live in a country that is capable of shooting for the stars and solving big problems. Instead we are in a race to the bottom that has coincided with a political shift to the right that caters to rich and powerful interests. There are no liberal Republicans in elected office, at least not at the federal level. That is big change from even 25 years ago when Reagan was president. The viewpoints that pass as Republican mainstream in 2012 do not reflect conservatism but instead more closely resemble radical right-wing ideology. It’s almost a cult. Just look at the “pledge” that nearly every Republican has signed saying they will never raise taxes. It is irresponsible for someone elected to represent the people to sign such a pledge. Why do moderate Republicans put up with this? 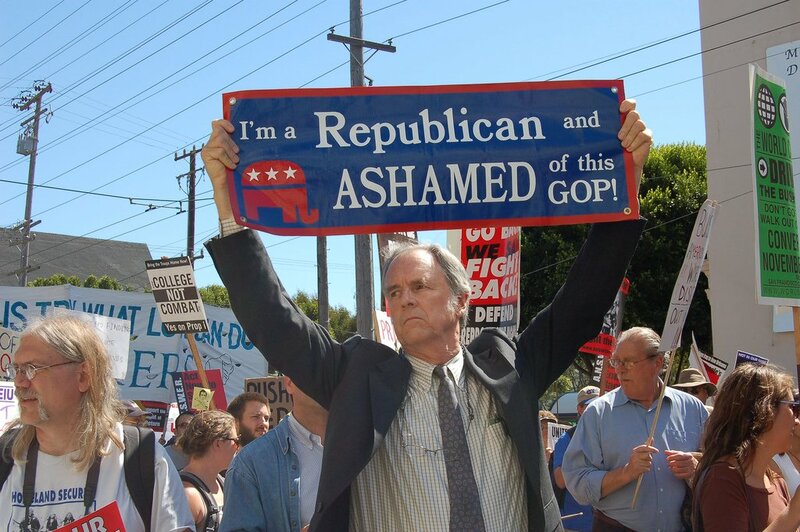 Why do they still embrace the Republican party? If they truly are moderates or conservatives why can’t they stand up for what they believe and take back the Republican Party? They can’t possibly listen to the increasingly extreme right-wing rhetoric and believe nothing has changed, can they? As for the Democratic Party, it needs to grow a spine. Yes, there are hints of courage, but far too often the Democratic Party backs down to the increasingly hostile right-wing radicals, otherwise known as Republicans. Democrats need to take a stand, even if it is at great political cost in the present. The long-term prospects for this country are much more important than short-term political gain. Left-leaning politicians need to be willing to sacrifice their temp jobs to stand for what is right on any number of issues like health care, women’s rights, the environment and gun control. Republicans have a neat little feedback loop built into their extreme right-wing ideology. They proclaim government is the problem and then they get elected to office and begin to tear government apart piece by piece so that it is indeed incapable of solving problems. Republicans are a cancer rotting away government to the core, and when they are through what will be left? If the American people choose Mitt Romney as the next president, what will be his prescription for America’s future? Tax cuts to the already wealthy and powerful while continuing to dismantle a government that once gave voice to the powerless?